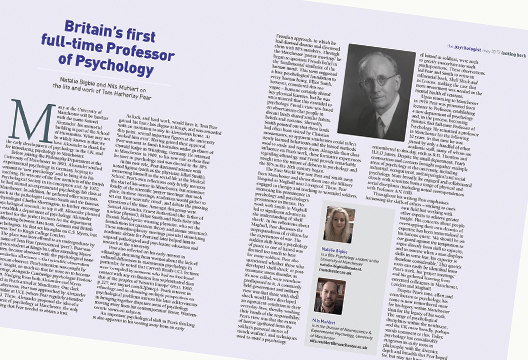 Natalie Bigbie and Nils Muhlert published a brief article in the May 2017 issue of The Psychologist about a largely forgotten figure in the history of British Psychology, Tom Hatherley Pear. Back in the 2001 volume Psychology in Britain, edited by Geoff Bunn and colleagues, I contributed a chapter on Pear and his peers. There were two main reasons for my interest. First of all, there was his vision of psychology as an essentially social science, and one that escaped from the constraints of laboratory research to engage in real-life issues. He not only questioned the mental stability of the incurably lab-bound psychologists, but also the disciplinary boundaries of psychology itself, writing in 1948’s ‘The relations between psychology and sociology’: ‘There should be much more co-operation between anthropologists, sociologists, political scientists, economists and psychologists, sectionalism has already gone too far’. He was one of the few academic psychologists to support, let alone acknowledge, the existence of the ambitious social research project, Mass Observation. Second, Pear’s career got off to an exceptionally early and auspicious start, with a ‘push’ from Charles Samuel Myers (who had taught him at King’s College London), and a ‘pull’ from Samuel Alexander (the professor of philosophy at Manchester and, at the time, highly influential internationally). Pear took up a lectureship in psychology at Manchester in 1909 immediately after he graduated, he became the first full-time professor of psychology in Britain in 1919, President of the British Psychological Society in 1942, and Dean of Science and Pro-Vice Chancellor at Manchester. And yet, even within his own life time, he was already being ‘forgotten’ within British Psychology. When he died in 1972 there were no obituaries, as far as I can discover, in any of the main psychological journals. What is missing from Bigbie and Muhlert’s account is why Pear himself went missing! This is not just an historical issue, but concerns the identity and future of British psychology. Pear was kicking against the methodolatry that continues to stultify the agenda of psychological research. Needless to say, things have not become better. The political and economic attractions of methodolatry are now especially compelling given the repeated oppressive cycles of national research evaluations. The psychological contribution to the medical teaching was not widely appreciated. It was derided as ‘codology’ (in other words, a load of old cod). Laura Miles, a secretary in the psychology department shortly after Pear’s time, once told me that the medical students had even taken to throwing paper darts at one of the psychology lecturers. So it wasn’t fun. Jack Kenna, based in the Medical Faculty (and, by the way, a wonderful early archivist for the British Psychological Society) was close to Pear and sympathised. He told me once that Pear ‘always spoke of doctors with a certain disdain, with that characteristic pursing of lips’. There is a certain historical irony in the fact that the second author, Nils Muhlert, belongs to ‘The Division of Neuroscience and Experimental Psychology’, a relatively recent organisational innovation in Pear’s old department. Pear, as I have tried to explain, hated divisions. His big mistake, politically, was to insist that psychology could – should – be of human, and, as I see it, even humane, relevance.